Just wanted to tell you guys how much I've been enjoying the standard Pyramid Trigger! First, I put one on my G43 - liked it so much I put one on my G19. So crisp… so smooth… so accurate. This is the trigger that should come standard on all Glocks. Keep up the good work! I have been a Glock carrier for many years now. I have been in Law Enforcement for almost 6 years and have carried the same Glock 22 since day 1. Through your amazing store I have been able to make modifications to my Glock with aftermarket parts. I look forward to future purchases with the online store. I wanted to express my joy with the end result of the Polymer80 compact we built together. I completed it on Sunday (still haven't made it to the range) and the end result is simply stunning. Attached is a picture next to the first Polymer80 (with almost all Glock factory parts from Glockstore) and it's already causing jealousy from friends around the world. Thanks for the time and effort put into making this piece. It will bring me joy for years to come. I am new customer and have bought some stuff from your company. I just wanted to say that my experience was excellent! I spoke to a few customers support people, and technical guys, and they were all helpful. Seldom do I find a company that will spend extra time to answer questions. Thank you very much and you will be highly recommended! To the customer service people, randomly answering the phone, I would like to say you all are exceptional. First time Glock owner. Plenty of Springfield's and a couple Taurus' with a Sig thrown in for good measure. All the time looking for MY handgun. I found it in a Glock 17 Gen4! Thanks to your great store, and Lenny's informative videos, I have added a Double Diamond Barrel, the 3.5 pound Connector and a host of other look good goodies. I'm already planning my next Glock purchase after I sell my XDM, 45 ACP and replace it with a Glock 21, Gen4. Can't wait to start customizing it! Great store and you have always sent me exactly what I want and quickly. Glock for life! I have been to your store quite a few times and have purchased guns and upgrades. Your people are the best. They are knowledgeable, customer oriented, and easy to work with. I have gone to other shops and there, you are just another number. I compare the GlockStore to the Apple Store and they are very similar. You are developing a great culture and great employees. I have worked with the store manager and with Nick (a customer rep). Both terrific! I will be coming back. Just bought a Glock 19 and will pick it up 6/10. Keep up the good work! I am having another Glock built in your Custom Shop! I talked to Eric M. this past Saturday and he helped me with another build. I wanted a G26 for EDC. I didn't want any flash I just wanted a Glock that was simple with a few upgrades to enhance the performance. Eric knew exactly what I was looking for. Then I saw your email this morning about the +4 magazine extension for the G43. That changed my mind from the G26 to a G43. I called Eric to see if my G26 had been started on and he said no that they were waiting on the barrel. I ask him if it would be any trouble to switch my build to a G43 done the same way. He assured me that it would be no problem at all. So I'm having a G43 built with a Double Diamond Barrel, all extended controls, Double Diamond 3.5 pound connector, Tungsten Guide Rod, Truglo Tritium TFX Pro sights, and of course 2 of the +4 magazine extensions mounted on 2 Glock G43 magazines. Again Eric was very patient with me and helped me put together exactly what I wanted. Eric is a pleasure to deal with and my needs and expectations seemed to be a top priority to him. I call this G43 build: "STRICTLY BUSINESS-NO SHOW--ALL GO"
THANKS AGAIN for a GREAT STORE with GREAT PRODUCTS and AWESOME EMPLOYEES!!! I have been a Glock carrier for many years now. I've been in Law Enforcement for almost 6 years and have carried the same Glock 22 since day 1. through your amazing store I have been able to make modifications to my Glock with aftermarket parts. I look forward to future purchases through the online store. Lenny - I'm 48 and have been an avid shooter for almost 40 years including probably over a million small and medium caliber rounds in the military. It took me 47 years to get a Glock and I've bought two now. I have really enjoyed using your videos to make various upgrades on my own. It's become a nice little hobby for me. Thanks for the fun! Good evening Lenny, I hope all is well! To begin with, I want to thank you for the very informative videos you have created as they have helped me understand better my Glocks, how to continuously improve their performance and the new products available. They have been extremely helpful and you have my gratitude. After viewing your videos and visiting the GlockStore Performance & Custom site, I prepared a shopping list and called to place my order. I was answered enthusiastically by Bob and once he understood that I was calling from Canada, I was efficiently transferred to Aaron who took my order. This was my first experience dealing with the GlockStore and I want to thank and congratulate you for the exceptional service I received from Aaron during my recent order placement. He was professional, courteous and attentive. He was well aware of the items I wanted to order and was able to provide input and recommendations. His client centric skills made this experience a pleasant one and you have gained a new repeat client. I am looking forward to the reception of my order so I can upgrade my Glocks and try the improvements. Lenny, I wish you and your team continuous success and once more thank you and Bravo! I want to thank the Glockstore for doing a great job on handling my firearm and a special thank you to Eric Brooks along with the custom shop for the great care and designs of my new G30S !! There outstanding approach at their job is outstanding !! Thanks again, and looking forward to doing business with you again in the future !! Hats off to you. Many thanks for my Storm lake barrel. I know have 3 in. groups at 50 yds with my reloads. 180gr tapered cone lead. 4.8 grains win.231. I reached my goal. with my glock 20. Just wanted to shout out a big thank you and Your Team for doing such a nice job on my Glock 30S. I love it! Please extend my sincere appreciation to everyone who touched it... they did great! I have purchased from hundreds of gun stores, both local and online through the years, but I can undoubtedly say The Glock Store is one of the friendliest, knowledgeable, and quickest stores I have dealt with. The phone staff was knowledgeable and quick with any questions I need answered. On top of that, price checking some of your items to other stores shows that you are among the most competitive prices out there. My first order arrived within days of placing the order and my second order involved some custom work and is expected to be delivered tomorrow… several weeks ahead of the quoted time. On a side note, I recently watched one of The Glock Store you tube videos and quickly became hooked and have now watched all of them. Most I have known how to do, or have known the content, but many taught me quick tips and tricks on how to be more efficient. I will be purchasing a lot more through the GlockStore. I ordered a Sight Pusher from you guys like 2 days ago. I think it was Thursday night actually. I just got it today. Damn that was fast! I would just like to say thanks for great service and speedy delivery. I ordered new pins for my Glock and unfortunately they were on back order. I got confirmation today that they shipped! I was surprised because they were on back order. No other store has ever shipped an item that fast that was on back order. I will never order from another store again. Y'all are awesome. The GlockStore is the best place to buy a Glock. The best place to buy accessories and the training - instructional videos are extremely helpful. Nice job Lenny! I’m a Customer for life! 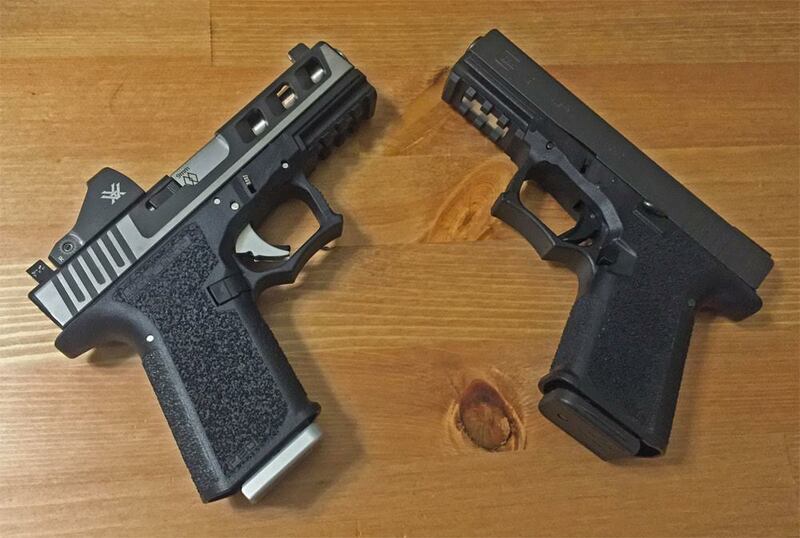 I just finished installing several of your parts on my new G17 by simply watching Lenny do it on the videos and following his steps. Thank you for providing these instructional videos that make it so easy. You guys are absolutely great and that is the reason I come back to you for upgrades and supplies for my Glock. I ordered a SS recoil spring for my G20 . I was only charged 7 bucks for shipping and received it in 2 days with $100 insurance on the package. 2 days! Wow, I live in Rhode island (lol). You guys are the best! I just wanted to say thanks. After installing the pyramid trigger system on my Glock 22; along with a 3.5 pound connector, I have to say… WOW!!!!!!!!!!!! I love the adjustable trigger and the lighter pull weight. I just came back from the range after putting 150 rounds through it and it functioned flawlessly. I'd like to see more GlockStore manufactured products come available. I even love this more than the fulcrum trigger system! It’s awesome! I would like to thank customer support rep Josh for taking care of my order and getting me the parts before the first three-gun competition of the season. I will definitely recommend the other gun club members to the GlockStore site for all there three-gun supplies. Hey, just a thanks for all the helpful people you have there. I just had a chat with Robert B (I think that's right) and he was very helpful. The videos you post on installations are priceless they let guys like me do all my own work. Keep up the good work this company has really set the bar. Over the last three days, I spent over TWO HOURS at a competitors site… I was comparing their prices of buying their 'kits of springs' vs. buying the springs 'piece by piece', but their 'search feature' is IMPOSSIBLE TO USE ! This sweet Colorado gal who answers their phone is so nice, but I finally gave up… Then I found your site. In half an hour, I set up an account, found EVERY 'Glock 19 rebuilding part.’ then tossed each one into my shopping cart. A couple things cost more, but most were cheaper. Yep, we're all on the side of FREEDOM and the US CONSTITUTION, but making it easy for your customers is just GOOD BUSINESS! Thank you, and God Bless America!! !